Japanese toy maker Takara Tomy has recently announced a brand-new collaboration between two huge franchises: Transformers and Evangelion! The joint effort was revealed in hobby magazines, and shows off promotional art as well as gives a short fictional backstory behind it, combining the fictions of the two franchises into one giant event. This collaboration is part of the 30th anniversary celebration of the Transformers franchise, which originated as a rebranding of the Japanese toy lines Diaclone and Microman, and officially launched in 1984 with the toy line and animated TV series. 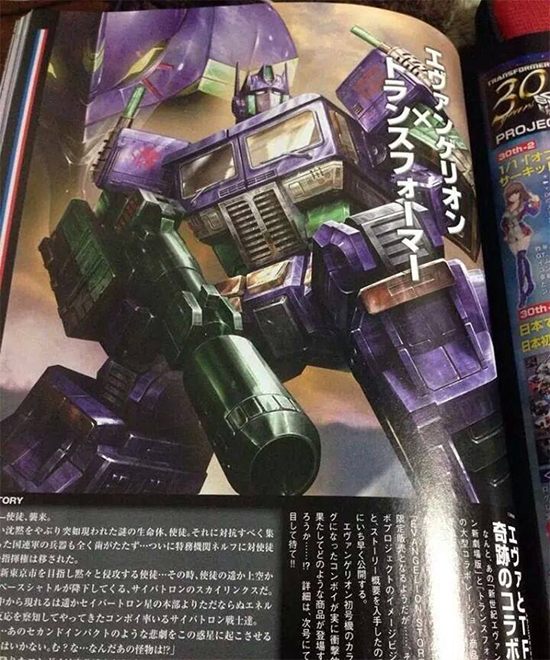 While not much is known about the crossover, the magazine hints at a toy release of Optimus Prime colored in Evangelion Unit 01’s iconic purple and green. This new collaboration, alongside the upcoming summer movie “Transformers: Age of Extincion”, makes this year one to remember for Transformers fans all across the globe!